Not to be confused with Srirangam. "Seringapatam" redirects here. For other uses, see Seringapatam (disambiguation). 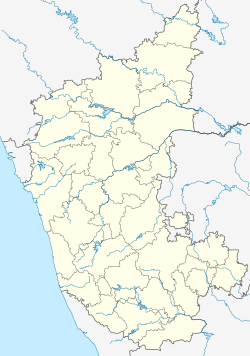 Srirangapatna (also spelled Shrirangapattana; anglicized to Seringapatam during the British Raj) is a town of Mandya district in the Indian State of Karnataka. Located near the city of Mysore, it is of religious, cultural and historic importance. The monuments on the island town of Srirangapatna has been nominated as a UNESCO World Heritage Site, and its application is pending on the tentative list of UNESCO. Although situated a mere 15 km from Mysore city, Srirangapatna lies in the neighbouring district of Mandya. The entire town is enclosed by the river Kaveri to form a river island, northern half of which is shown in the adjacent image. While the main river flows on the eastern side of the island, the Paschima Vaahini segment of the same river flows to its west. The town is easily accessible by train from Bangalore and Mysore and is also well-connected by road, lying as it does just off the Bangalore-Mysore highway. The highway passes through this town and special care was taken to minimize any impact on the monuments. As of 2001[update] India census, Srirangapatna had a population of 23,448. Males constitute 51% of the population and females 49%. Srirangapatna has an average literacy rate of 68%, higher than the national average of 59.5%: male literacy is 74%, and female literacy is 63%. In Srirangapatna, 10% of the population is under 6 years of age. Srirangapatna is at 12°25′N 76°42′E﻿ / ﻿12.41°N 76.7°E﻿ / 12.41; 76.7. It has an average elevation of 679 metres (2227 feet). Srirangapatna Sangama is the confluence of the three holy streams creating the island. Located 27 km upstream from the town is the spectacular Shivanasamudra Falls, the second biggest waterfall in India and the 16th largest in the world. Control of the fort of Srirangapatna, the fortification nearest to the capital city of Mysore. Srirangapatna remained part of the Kingdom of Mysore from 1610 to after India's independence in 1947; as the fortress closest to the capital city of Mysore, it was the last bastion and defence of the kingdom in case of invasion. Srirangapatna became the de facto capital of Mysore under Hyder Ali and Tipu Sultan. When Tipu finally dispensed with the charade of deference to the legitimate Wodeyar Maharaja who was actually his captive, and proclaimed the "Khudadad State" under his own kingship, Srirangapatna became de jure the capital of this just and ably managed kingdom. In that heady period, the state ruled by Tipu extended its frontiers in every direction, encompassing a major portion of South India. Srirangapatna flourished as the cosmopolitan capital of this powerful state. Various Indo-Islamic monuments that dot the town, such as Tipu Sultan's palaces, the Darya Daulat and the Jumma Masjid (Friday congregational mosque), date from this period. The Treaty of Seringapatam (also called Srirangapatinam), signed 18 March 1792, ended the Third Anglo-Mysore War. Its signatories included Lord Cornwallis on behalf of the British East India Company, representatives of the Nizam of Hyderabad and the Maratha Empire, and Tipu Sultan, the ruler of Mysore. At the battle's climax, Tipu Sultan was killed within the fort of Seringapatam, betrayed by one of his own confidants; the spot where he ultimately fell is marked by a memorial. For the last time in history, Seringapatam had been the scene of political change in the Sultanate of Mysore. The joint forces of the victorious army proceeded to plunder Seringapatam and ransack Tipu's palace. Apart from the usual gold and cash, innumerable valuables and objets d'art, not excepting even the personal effects of Tipoo Sultan, his rich clothes and shoes, sword and firearms, were shipped to England. While most of this is now to be found in the British Royal Collection and in the Victoria and Albert Museum, some articles have occasionally become available at auctions and have been retrieved for their native land. The sword of Tipu Sultan has been acquired by Vijay Mallya, a liquor baron from Karnataka, who purchased the same at a Sotheby's auction. Much of the site of the Battle is still intact including the ramparts, the Water Gate, the place where the Tippu Sultan's body was found, the area where the British prisoners were held and the site of the destroyed palace. Tipu's Tiger, an automaton now in the Victoria & Albert Museum, was captured at the battle. The town is famous for a very ancient temple dedicated to Sri Ranganathaswamy, a form of Lord Vishnu. There is also Kalyani Siddhi Vinayaka Temple in front of the Sri Ranganathaswamy Temple. Other temples in Srirangapatna include the Lakshminarasimha Swamy Temple, Jyothi Mahaswara Temple, Bidhcotta Ganesha Temple, Panduranga Swamy Temple, the Sathyanarayana Swamy Temple, the Anjunaya Swamy Temple, the Ayyapa Temple, the Gangadhareswara Swamy Temple, and RaganathaNagara Ganesha Temple, Lakshmi Temple, Sri Raghavendra Swamy Mutt on Old Post Office Road, surrounding Srirangapatna in fort 8 Ganesh & Anjunaya temples. The Karighatta (Black Hill) and its temple of Lord Srinivasa is a few kilometres from the town. The deity is Kari-giri-vasa (one who resides on the black hill). The renowned Nimishambha Temple is about 2 km from the town. Srirangapatna also hosts the summer palace of Tipu Sultan and his mausoleum. The Ranganthaswamy Temple – usually referred to as "Sri Ranganathaswamy" – is dedicated to Ranganatha, a manifestation of Vishnu. It is one of the five important pilgrimage sites along the river Kaveri for devotees of Ranganatha. These five sacred sites are together known as Pancharanga Kshetrams in Southern India. Since Srirangapatna is the first temple starting from upstream, the deity is known as Adi Ranga (lit; "first Ranga"), and the town of Srirangapatna, which derives its name from the temple, is on an island in the river Kaveri. The Dariya Daulat Palace (Summer Palace) is set amidst beautiful gardens called Daria Daulat Bagh. Tippu Sultan built this palace in 1784. The palace is built in the Indo-Sarcenic style in mostly made of teakwood. The palace has a rectangular plan and is built on a raised platform. Other attractions in Srirangapatna include the Jumma Masjid (a Mosque) and the Daria Daulat Gardens. 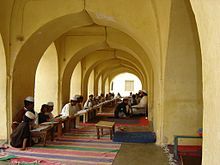 The mosque has stone Arabic inscriptions which mention the 99 titles given to the Prophet Mohammed, and the Farsi inscriptions which mentions that the Jamia Masjid called Masjid-E-Ala was built in AD 1782 by Tipu Sultan. The Gumbaz is an impeccably detailed mausoleum and houses the remains of Tipu Sultan, his father Hyder Ali and his mother Fatima Begum among beautifully manicured gardens. Various tombs of other relatives surround the gumbaz, some with small signs offering guidance on which specific individuals are buried here. The outer gumbaz columns are made of amphibolite, a very dark rock that exudes a somber richness. Handcrafted door frames covered in a deep lacquer finish lead into an inner tomb illuminated only by natural light. All visitors are welcome inside, and even encouraged to enter by the friendly doormen. The Karighatta viewpoint gives good panorama of Mysore and Srirangapatna cities from a height of 3,000 feet. Karighatta is a hill a few kilometres outside the 'island' town of Srirangapatna. The name Karighatta translates to "Black Hill" in Kannada. The hill supports dry scrub jungle and many tamarind and gooseberry trees are found around the temple. A small river, Lokapavani, a tributary of Kaveri flows by the hill. The main entrance to the temple, with huge wooden doors opens into a large quadrangle, which is the main shrine for Vaikunta Srinivasa in black stone, flanked by Yoga Srinivasa (without his consort) and Bhoga Srinivasa idols. The hill may be climbed by stone steps (450 in number). A winding paved road is used for vehicular transport. The stone steps lead to a flat hilltop where the temple stands. The hillock has a superb panoramic view of Srirangapatna and Mysore. The beautiful landscape around the hill and the confluence of the Kaveri and Lokapavani rivers can be seen from atop the hill. The famous Nimishamba (the incarnation of Parvathi, the goddess wife of Lord Shiva) temple is on the bank of the Lokapavani river. This temple too can be clearly seen from the top of the Karighatta hill. It is a belief that Parvathi will clear all the problems and troubles of her devotees within a minute (nimisha in Sanskrit), and hence the name. The Garrison Cemetery is located in Srirangapatna, on the banks of the river Cauvery, about 300m from the Bangalore Mysore Highway. It has about 307 graves of the European officers killed in the final assault on Tippu Sultan in 1799, and their family members. Among the graves, there are 80 graves of the officers of the Swiss Regiment de Meuron, and the rest of the graves are their family members. The Scott’s Bungalow is located in Seringapatam on the banks of the river Cauvery, at about half a mile from the Mysore Gate of the Seringapatam gate. The bungalow was the residence of Col. Scott, an officer of the Madras Army who took part in the Siege of Seringapatam in 1799. The bungalow is associated with the legend and tradegy of Col. Scott. The story of Scott’s Bungalow is lamented in a poem by Walter Yeldham called The Deserted Bungalow, published in 1875. Between the Garrison Cemetery and Scott’s Bungalow a path leads to house on the river banks. This house is known as Lord Harris's House or The Doctor's Bungalow or Puraniah's Bungalow. This house was the residence of General Harris, for a short time after the Siege of Seringapatam in 1799, and went on to become headquarters of the commanding officer of Seringapatam. In 1809, the house was the scene of a mutiny by officers of the Madras Army, led by Col. Bell, against Sir. George Barlow, the Governor of Madras. Purnaiah, lived in this house after his retirement from service in 1811, and died there on 28 March 1812. A tablet on the wall records the connection of Lord Harris and Puraniah to the house. The fortress is in the west of the island, and is surrounded by double walls. The point at which the British broke through the walls, and thus Tipu Sultan's troops surprised, is marked by an obelisk. Also highlighted is the place where Tipu Sultan was killed by the British forces. In addition, the dungeon in which the Mysore rulers had imprisoned British soldiers. This was the place where Tipu Sultan used to imprison all the British officers. It is near the death place memorial of Tipu Sultan and is surrounded by gardens on all four sides. Lord Bailey was the only British officer who died in that place and could not make it through the tough conditions and so it was later named after him. Another version says that the commanding officer of the British at the Battle of Pollilur (1780), Col. Baillie, was imprisoned here after the defeat of his troops in the First Mysore War. Near the town is the Ranganathittu Bird Sanctuary, where several bird species breed, including the painted stork, open-billed stork, black-headed ibis, river tern, great stone plover and Indian shag. Bernard Cornwell's Sharpe's Tiger is a fictionalised account of the Battle of Seringapatam. It concentrates on the exploits of the fictional character of Richard Sharpe, and the historic Arthur Wellesley, later the Duke of Wellington. Wilkie Collins' The Moonstone includes a prologue that takes place during the Battle of Srirangapatna, entitled "The Storming of Seringapatam (1799)," during which a British officer steals a sacred Hindu diamond that becomes the mystery at the centre of the novel. John Forster mentions in The Life of Charles Dickens that in a childhood playground of C.D., "he had been... delivered from the dungeons of Seringapatam, an immense pile ('of haycock'), by the victorious British ('boy next door and his two cousins')..." See pg. 10 of the Everyman edition published in 1969. First published: London; Chapman and Hall, 1872-1874 in 3 volumes. ^ The fall of Srirangapatna to the Wodeyar dynasty in 1614 is much celebrated in local ballad and legend, one of which concerns a curse put upon the Wodeyars by Alamelamma, the lamenting wife of the defeated Vijayanagar viceroy. In fulfillment of that curse, no ruling Maharaja of Mysore has ever had children; the succession has inevitably devolved upon brothers, nephews or adopted heirs, or on children born to the Maharaja before his accession, but never has a child been born to a ruling Maharaja. ^ "Introduction". Seringapatam 1799. Macquarie University. Retrieved 11 January 2011. ^ Charya, S V Upendra (13 August 2013). "Where Tipu Sultan used to pray" (Bangalore). Deccan Herald. Retrieved 2 February 2015. ^ "www.mysore.ind.in - mysore.ind.in - Devaraja Market - Everything about Mysore Attractions !". mysore.ind.in. Retrieved 30 June 2017. ^ Wright, Colin. "The Wellesley Bridge, Seringapatam". www.bl.uk. Retrieved 30 June 2017. ^ Photos, Old Indian. "The Wellesley Bridge in Srirangapatna, Karnataka - c1850's". www.oldindianphotos.in. Retrieved 30 June 2017. ^ Kumar, M T Shiva (9 March 2013). "There is life at the cemetery" (Bangalore). The Hindu. Retrieved 3 February 2015. ^ "Garrison Cemetery". Mysore. Retrieved 3 February 2015. ^ Chetti, P Stephen Basappa (1897). A Guide to Seringapatam and Its Vicinity; Historical and Traditional. Mysore (British India): Town Press. p. 24. Retrieved 25 September 2015. ^ "Scott's Bungalow". Mysore.ind. 2015. Retrieved 25 September 2015. ^ Harshitha, Samyuktha (12 March 2013). "The Srirangapatna that I know". Retrieved 25 September 2015. ^ Parsons, Constance E (1931). Seringapatam. H. Milford. pp. 155–157. Retrieved 25 September 2015. ^ "Sharpe's Tiger page from Cornwell's website". Archived from the original on 6 July 2011. Retrieved 30 June 2017. ^ "The Moonstone by Wilkie Collins". Retrieved 30 June 2017 – via www.gutenberg.org. Wikimedia Commons has media related to Srirangapatna.